Kerry did it a day after Congress’ deadline, but he finally said that ISIS is committing genocide against Christians. Only after intense lobbying by a broad mix of Christians, did our government make this statement. Why did it take so long, and why was it even an issue?? But with this declaration, the Christians will get special assistance, along with the Yazidi, Turkmen, and other groups. It’s great that he did it, but again – why was there even a question in the minds of our leaders that Christians were being systematically butchered and expelled?? 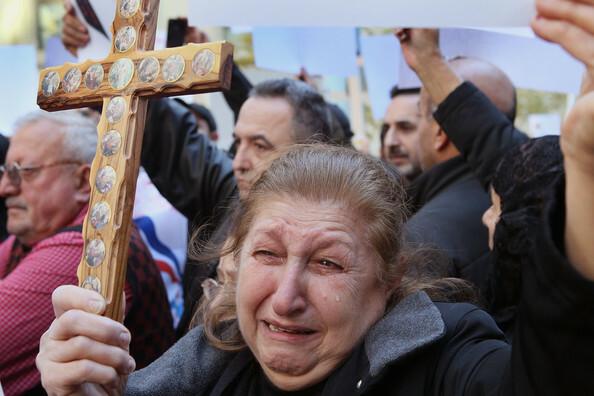 U.S. Secretary of State John F. Kerry declared Thursday that the Islamic State group is responsible for genocide against Christians and several other religious minorities in Syria and Iraq. Kerry made the remarks in a carefully worded statement he delivered at the State Department in Washington, a day after a congressionally mandated deadline for State to issue its findings and in the wake of much lobbying for a declaration that includes Christians. In addition to defeating the Islamists and documenting their crimes, explained Kerry, efforts must be made to get to the root cause of the genocide and prevent future occurrences of it. “The best response to genocide is a reaffirmation of the fundamental right to survive of every group targeted for destruction,” he said. “What Daesh wants to erase, we must preserve. That requires defeating Daesh, but it also demands the rejection of bigotry and discrimination — those things that facilitated its rise in the first place. The statement seemed calculated not to single out Christians as the victims of genocide; it spoke about attacks on Kurds, Shiites and Turkmens as well. Aides said that Kerry does not want to fuel perceptions that the United States is engaged in a modern-day crusade against global Islam, according to The Washington Post. NBC said that a key issue facing the administration is whether it will be obligated to take action to stop the genocide. CNN said that Kerry’s declaration does not legally obligate the U.S. to take any particular action, but it could put pressure on the Obama administration to take more aggressive military action against ISIS. “It could also give weight to calls by other lawmakers and humanitarian groups pushing the Obama administration to welcome more refugees into the United States,” the news outlet said. Republicans and Democrats in the House joined together 393-0 to back a “sense of Congress,” saying the crimes committed against Christians, Yazidis and other ethnic and religious minorities in the region amount to war crimes and, in some cases, genocide. Also welcoming Kerry’s declaration was Robert Nicholson, executive director of the Philos Project. Nicholson noted that his organization and the Iraqi Christian Relief Council have pushed for a safe haven for Christians in Iraq and Syria, “not just shipping them out of the region” as refugees. “The next thing would be referring this matter to the United Nations Security Council and have the same finding there, which would really trigger a global response and up the ante in terms of destroying ISIS,” Nicholson said. But U.S. Rep. Chris Smith, chairman of the House panel that oversees global human rights, said the International Criminal Court would be ineffective and that it would be better if the US would work with the UN Security Council to set up an ad hoc regional tribunal. Regional tribunals, he said, proved effective in Sierra Leone, where nine people were convicted; Rwanda, where 61 were convicted, and the former Yugoslavia, where a tribunal convicted 80 people. “This is a significant step, that follows the European Union recognition of genocide, that I hope will encourage [the British] government to also recognize these unacceptable acts of genocide against vulnerable communities in the Middle East,” Bishop Angaelos said. John Burger is news editor for Aleteia’s English edition. « Petition to Kerry: Denounce ISIS Persecution of Christians as Genocide.